Imperial Art Appreciation: Yellow is licensed under a Creative Commons Attribution 3.0 Unported License. Permissions beyond the scope of this license may be available. Posted to Flickr on 05 August 2009. Part of the Stormtroopers series. "Okay cadets, lesson three of Art Appreciation is about the color yellow." "Think about yellow for a moment. You might find yourself imagining happiness, sunshine, and wealth. Good ol’ mellow yellow." "However, most often the color yellow is associated with negative concepts: cowardice, illness, greed, womp rats, and of course protocol droids. 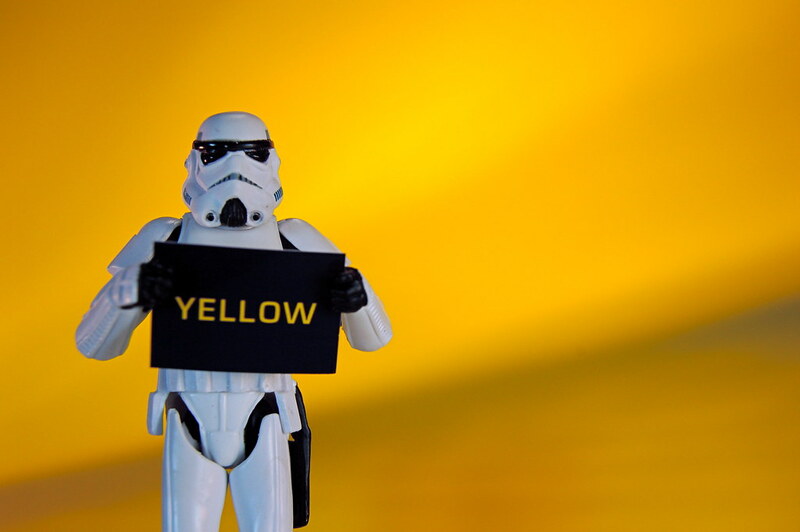 Picture yellow as a sign meaning ‘Annoying Hazard Ahead.’ Best neutralize or eliminate things that are yellow as quickly and efficiently as possible." Today’s lesson: With the color yellow, blast first and ask questions later. Part of my Stormtroopers and Imperial Art Appreciation series. This photo was posted to Flickr on 05 August 2009. It was one of 500 images featured on Flickr Explore for that day. The last time I checked, it had 20,329 views on Flickr. Imperial Art Appreciation: Yellow by JD Hancock is licensed under a Creative Commons Attribution 3.0 Unported License. Permissions beyond the scope of this license may be available.